At least there's some good news for the Michigan hockey program this week. 1996-born forward Dylan Larkin has committed to the Wolverines according to Mike Spath and College Hockey PROSPECTive. Larkin, a forward for Belle Tire's midget minor team, has 13-7--20 in 17 games this year. His 13 goals this season is tops on the team, which leads the Great Lakes Division of the MWEHL with a 14-0-3 record. The next highest on the team has 9 goals. He's also second in points (Kyle Connor has 21). Surprisingly, only one of his 13 goals has come on special teams, so he's getting it done at even strength. He also leads the team with 4 game-winning goals. League-wide, he's tied for 17th in points (and points per game) and tied for fourth in goals. The league-leader has 15 tallies. In the 2011 MAHA State Tournament, Larkin scored 5-11--16 in five games. A year ago, his 23-24--47 line put him third in goals, fifth in assists, and third in points. They downed the Chicago Mission 6-5 in the U14 National Championship. Larkin had a goal in the championship game. I'm going to list him as a 2014 until I hear otherwise. 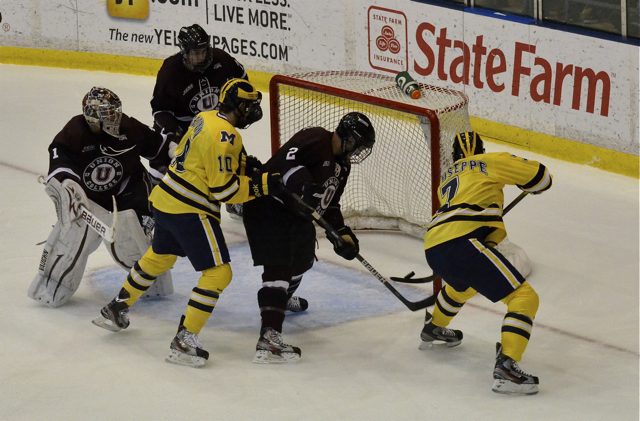 After a rough start to the CCHA season (3-5-2-1), the Wolverines return to non-conference play for a weekend. With the demise of the College Hockey Showcase thanks to Wisconsin footballifying their non-conference hockey schedule, the Wolverines have scheduled games against Northeastern (Friday) and Union (Sunday afternoon) this weekend. Northeastern is 3-7-2 on the season and are just 1-5-1 away from home in Jim Madigan's first season behind the bench. The Huskies dove right into the Hockey East schedule at the start of the season. This is actually their first non-conference game of the year. Despite the tough start to their season, the Huskies are coming off a pair of wins last weekend. On Friday night, they defeated Providence by a 5-2 score. The next night, they downed Vermont 4-1. They've also given some good teams a run for their money. They've lost two one-goal games to Boston College (once in overtime) and in early-November they took the only unbeaten team in the country, #1 Merrimack (yes, Merrimack), to overtime on back-to-back nights, tying one and losing one. They'll be a test for a Wolverine team that has dropped five of its past six (counting the SOL to Miami). Northeastern has struggled to put the puck in the net against good teams, however. They've scored just 8 goals in the 5 games they've played against ranked opponents. They've been led offensively by freshman Ludwig Karlsson, who has 6-4--10 in 10 games. He had three goals last weekend and was named Hockey East Player of the Week. Justin Daniels has 5 goals and 4 assists in 12 games. Vinny Saponari, formerly of the USA NTDP, has 8 assists on the year to lead the team. They don't get a ton of offense out of their blueliners. The whole crew has only accounted for 14 points on the year. They're very young on defense. Junior Drew Ellement is the only upper-classman. Beyond him, they've got 3 sophomores and 3 freshmen on the roster. Junior Drew Daniels is listed as a forward but has played the entire season back on D. Last weekend they dressed 2 freshmen, 2 sophomores, and 2 juniors. In net, all but one decision has gone to three-year starter Chris Rawlings. The junior is 3-6-2 on the year with a 2.59 goals against and a .927 save percentage. Very solid. He's improved both of those numbers each season. Last year he had a 2.68/.920. One strange note: Last year, he faced either BC or BU eight times in a 10-game stretch. He's a big dude, listed at 6'5", 207. He also just recently tied Brad Thiessen atop Northeastern's career shutouts list (9). Northeastern has always played Michigan tough. Back in the 06-07 season, they gave up a tying goal to Chad Kolarik with 5 seconds left in regulation before falling in overtime. They rebounded the next night by knocking off Michigan at Yost. They also beat the Wolverines in the Left McFadden tournament to kick off the 2004 season. If I remember right, we were ranked #1 at the time. I definitely remember that I was working at the Michigan Union Bookstore at the time, heard the score as I was leaving for the day, and was pissed. It's amazing that I can't remember what I had for lunch yesterday, but I can remember where I was when we lost a hockey game seven years ago. Michigan is led by the junior duo of A.J. Treais and Lindsay Parks with 13 points apiece while nine skaters have registered double digits. They have seven players who have been drafted. Three of them have been picked by San Jose. Sophomore Cody Ferriero is the brother of Benn, a former standout at Boston College. On Sunday afternoon, the Union Dutchmen come to town. The #13 team in the country is 6-3-3 on the year and have been excellent on the road, boasting a 5-1-1 record away from the Achilles Center. There are two caveats to that: 1) They play in the ECAC, so they automatically get an asterisk. Blame Yale for that. I made that rule after the NCAA Tournament last year. 2) This kind of goes along with #1, but the quality of competition is a question mark. To their credit, they tied WMU twice. Aside from that it's been Army, Niagara, RIT, UNH, American, St Lawrence, Clarkson, Brown, Yale (a 4-0 loss), and RPI. Their prowess away from home isn't limited to this season. They're 12-1-1 in their last 14 road contests. They have been rather stingy on defense as of late. Outside of the four goals that Yale scored, they haven't given up more than 2 since Oct. 21. That's 8 goals in 7 games (or 12 in 8 games if you include the contest against Yale). Between the pipes has typically been sophomore Troy Grosenick. For the year, he has a 5-2-2 record with a 1.62 goals against and a .935 save percentage, good for third and fifth nationally. Last year he only recorded one decision. Against Yale, he was chased after just 22 minutes. Offensively, senior Kelly Zajac leads the way. He is 5th nationally with 13 assists, and has 16 points on the year. He's also the brother of NHLer Travis Zajac, formerly of North Dakota. Kelly had 42 points last season. Mat Bodie has 10 helpers from back on the blueline. Putting those pucks in the net are Jeremy Welsh (7, including 5 on the power play) and Wayne Simpson (6). Daniel Carr has 5-5--10 on the year, but three of those goals came in their last outing, a 5-1 win over RPI. Carr-Zajac-Simpson make up a dangerous top line. Their power play is clicking along. Union ranks 5th nationally, scoring on 26.2% of their power plays. They've notched 16 goals with the man advantage this season, which works out to 1.33 power play goals per game. Staying out of the box would be nice. Their PP accounts for 42% of their offense. They've also been really strong on faceoffs this year, at 56.2%. We've actually played a surprising number of common opponents so far this season. Based on the results, they would point toward Michigan having an edge in this game. They tied Niagara 3-3. We beat Niagara 5-0. They tied WMU 2-2 and 3-3. We lost 3-2 and won 5-2. They beat SLU 2-0. We beat them 10-3. This is the first time that Michigan and Union have ever faced off. They are the only ECAC team that Michigan has never played. Some love to their athletic department for linking to my site in their official blog's preview of the weekend. Michigan looks to rebound from 3 tough weekends. After being unbeatable at home for nearly a full year, they've now dropped 3 of the last 4 at Yost. Northeastern has played good teams tough, but has struggled to put the puck in the net against them. Union has a better record, but has some question marks as to the quality of the competition. They're not intimidated playing on the road, however. Their road record is proof of that. I'll take Michigan with two wins this weekend, though I think both of them will be closer games than you might typically expect, or that Red would want. In other news, the Rangers have called up Carl Hagelin and he may make his NHL debut tomorrow night. Hagelin leads the Connecticut Whale with 7 goals and is second on the team with 13 points. He's also second in the entire AHL with a +12 rating. That's the player we know! Bork bork bork. USA Hockey had a feature on Al Montoya, who hopes to make the 2014 US Olympic Team. Michigan officially received Letters of Intent from Jacob Trouba, Boo Nieves, Justin Selman, Daniel Milne, Connor Carrick, and Jared Rutledge. Michigan Hockey Net has updates on a lot of our recruits in his weekly recruiting roundup. Also, Bob Miller has started College Hockey PROSPECTive, a blog covering college hockey recruiting. It's very much a work in progress for the time being--he's targeting a true launch in January of 2012--but Bob is one of the best at covering the game and I very much look forward to reading his thoughts moving forward. That site will definitely be one to bookmark! Red Berenson's troops head south this weekend to take on the closest thing to a hockey dynasty that this world has ever known: The Miami RedHawks. In actuality, the RedHawks have been positively un-dynasty-like so far this year. They stumbled out of the gate, losing their opener against Bemidji, and started 0-4 in CCHA play after getting swept by Ferris and Lake State. Last weekend, they went up to Alaska and beat the Nanooks by a pair of 2-1 decisions, despite being outshot 30-14 on Friday night. The lack of offense has been a problem. Miami needed to replace Andy Miele, Pat Cannone, and Carter Camper after last season, and the result has been an offense that has scored just 2.30 goals per game this year, down from 3.75 a year ago. They currently rank 43rd in the nation in offense. Through 10 games, Reilly Smith is the only player on the roster with more than 2 goals (5-1--6). (To compare, Michigan has 8 players with 3+ goals.) Even Smith's scoring has been cut in half, though. He averaged a very impressive 1.42 points per game last season (28-26--54 in 38 games). As you'd expect, the power play has also struggled. They're clicking along at 14.0%, good for 40th nationally. The goaltending/team defense also hasn't been at the level they're accustomed to. Connor Knapp and Cody Reichard return for their senior seasons. Reichard is 3-3-0 on the year with a 2.46/.902. Knapp is just 1-3-0 with a 3.17/.888 (!!). The PK is at 81.4% and they have scored 3 shorties already this year. Knapp has lost three straight starts, and after giving up 4 on 15 shots in less than 30 minutes of work against LSSU, he did not play against Alaska. Reichard got both of those starts and gave up just two goals total. It'll be interesting to see if Blasi gets back to his goalie rotation this weekend, or if Reichard gets both starts again. I suspect it will depend on how tonight goes. If Reichard shuts Michigan down, he may just keep riding the hot hand. Reichard typically plays Friday nights in their rotation, so he'd get first crack regardless. I've always been more impressed with Reichard anyway. Last year, he held Michigan to two goals on 55 shots during a weekend sweep in Oxford. He was also in net for both games of their sweep at Yost in 09-10, again giving up just two goals on 49 shots. Michigan did beat him in the CCHA Semifinals during that magic run. Knapp was ridiculous in the tournament game where the quick whistle did Michigan in. He stopped 55 of 57 shots that night. Strangely enough, that's been his only start against Michigan since his freshman year, when he played the majority of three games. Freshman Tyler Biggs was Toronto's first-round pick in this year's draft after spending two years with the NTDP. He has 1-4--5 so far this year. This is a big weekend for the RedHawks. Despite their struggles, Miami could get back to .500 with a pair of wins. A Michigan sweep would put Miami at 2-6-0-0 in conference and 4-8-0 overall. That's quickly getting to the point of needing to put together a run to make the NCAA Tournament. Miami has struggled, but you have to think they'll right the ship at some point. It seems like Reichard has gotten back on his game, but the offense has still be uncharacteristically quiet. A couple of the Wolverine killers (Miele and Cannone) are gone, which is nice. It'll be interesting to see how Michigan responds to the hostile environment down there. I like the chances for a good weekend. Michigan has only been held below 3 goals one time this season and Miami has struggled to the put the puck in the net thusfar. Reichard has been great against Michigan in his career, so if Miami is going to get some points out of the weekend, he'll have to keep that up. Sorry for the lack of content. I'm out in Billings, MT for work so I've basically been in work-eat-bed mode. Michigan ended up completing the sweep of Ferris last weekend, winning the second game by a 4-0 margin. Shawn Hunwick made 24 stops, the Wolverines killed off 7 Ferris State power plays, and got goals from four different players. Alex Guptill got things going 5 1/2 minutes into the game. Luke Moffatt threw him a nifty little between-the-legs pass to complete a give-and-go and Guptill roofed one. In the second period, Travis Lynch and AJ Treais struck a couple of minutes apart to blow the game open. Bennett's shot from the point bounced around and Lynch took it right off Wohlberg's stick. It looked like it surprised Motte a little bit. PDG then blocked a shot and took off the other way. He centered it for Chris Brown. A sprawling Motte kept it out of the net, but he knocked it right to Treais, who lifted it up over him into the net. Later in the period that same trio struck again. This time it was Brown putting the puck in the net. Di Giuseppe fed Brown and he lasered one high up over the glove. That was all the Wolverines needed. Ferris outshot the Wolverines 9-3 in the third period, but Hunwick was perfect and the Wolverines had a sweep of the #6 Bulldogs. Travis Lynch was 13 and 2 in the faceoff circle. He has been a really pleasant surprise, though you could say that about any number of the freshmen. It was a fairly eventful week off the ice. Phil Di Giuseppe's OHL rights were traded from Niagara to Windsor as part of a big trade that also involved Jack Campbell. Windsor is clearly not the team you want your player to be on if you'd like to keep him in the NCAA. The thought seems to be that we don't have that much to worry about this season, but expect Windsor to take a run at him during the summer. It sounds like he was more of a guy they were taking a flier on, since he's clearly turned into a helluva find. Speaking of PDG, he was named CCHA Rookie of the Month for October. He has 5-4--9 and a +9 rating in 8 games. Hunwick was honored as CCHA Goalie of the Month thanks to his 6-0-1 record with a 1.37 goals against and a .949 save percentage. Di Giuseppe was also mentioned as a potential first round draft pick in a couple of mock drafts released by NHL.com. Jacob Trouba was cited as a top-ten pick in all three of them. Boo Nieves is listed as a mid-to-late first round pick in all three of the drafts. Di Giuseppe goes 11th in one of them and 28th in another. Also check out the link above for a roundup of how our recruits have been doing this season. Defenseman Jon Merrill was allowed to rejoin the team in practice, but has had his suspension extended from 12 games to "indefinite". 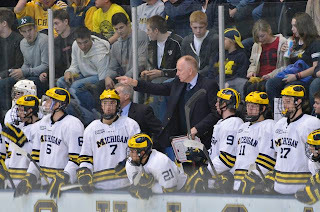 Credit Red Berenson for having the balls to suspend arguably his best player for what appears to be half the season. Also, we don't know what he did, but credit Merrill for sticking it out. It would have been the easy move to sign with the Whalers, but it appears he really wants to be a Wolverine. Hopefully he can get everything straightened out off the ice and get back to being the ridiculous defenseman that we know he can be. One player who has benefited from Merrill's absence is Mike Chiasson. The rookie blueliner is +14 and has not been on the ice for a single goal allowed this year. He also leads the team in blocked shots with 11. It's hard to believe that Michigan could have expected any more than what they're getting out of Chiasson. I was really impressed with him (Lynch, and Di Giuseppe as well) during the Niagara game, and they've all continued to be impressive as the season hits the 20% mark. The Wolverines already have 12 players with 5+ points. If you would have told me that 8 games into the season Kevin Lynch, Zach Hyman, and Luke Moffatt would have combined for 3 goals, I would not have liked Michigan's chances to be ranked #3 right now and rank #2 in offense. They're getting goals from everywhere right now, and that's a great sign given that three of Michigan's really talented players haven't cranked it up in the goals column just yet (though 2 of them are still averaging .5 ppg, which certainly isn't bad...that projects to a 20-21 point season). Hyman and Lynch look like the new Rust and Caporusso in the faceoff circle. How do you replace two of the best faceoff guys we've had? By bringing in two freshmen who are killer in the dot. Hyman is at 65.1% (!) right now. Lynch is just behind him at 62.1%. This weekend Michigan welcomes in the fourth-ranked Western Michigan Broncos. They come in 5-0-3 under Head Coach Andy Murray. (Side note: Whoever gave Yale a first place vote should have their ballot rejected. Didn't we learn that lesson last year?) Western has played to a win and three ties on the road so far this year, a pair of ties against Union and a win/shootout win up in Alaska. They swept NMU last weekend at home. WMU's 5-2 win over Michigan in the CCHA Tournament Semifinal last year snapped a 7-game Michigan winning streak in the series. Michigan has won 18 of the last 21. Chase Balisy returns after a 30-point freshman campaign. He currently leads the team with 3-6--9 on the young season. Classmate Shane Berschbach had 29 points last season and has 4-4--8 so far. Every skater who has dressed aside from Matt Stewart (one game played) has at least a point. Defenseman Matt Tennyson had 7 goals on the PP last season. He's yet to tally a PPG this year, but he does have 5 points. He'll be one to watch when we're down a man. Junior Nick Pisellini and freshman Frank Slubowski have split the netminding duties so far this year. Pisellini is 2-0-2 with a 1.68/.931. Slubowski is 3-0-1 with a 1.47/.918. Pretty stout, the both of them. They haven't gone with the Friday/Saturday split. Pisellini got both games at Union and one at Alaska. Slubowski played both ends of the NMU sweep. Western actually held NMU to 29 shots the entire weekend. They're the #12 offensive team and rank 4th on defense, giving up just 1.62 goals per game. Their power play is just 15% on the year, possibly because they haven't gotten Tennyson going just yet. The PK is at 88.6%. If Michigan is going to get Kevin Lynch out of his slump, this might be the week to do it. He has 3-5--8 in 5 games against the Broncos. Friday night's game will air on Fox Sports Detroit, while Saturday's contest will be on Comcast Local.